Harry Potter Half Blood Prince is one of the best games from this world wide marvel of a gaming series and sees the return of Harry in his quest to defeat the evil Lord Voldemort. The game has a really innovative story line and graphics that are out of this world and that coupled with the brilliant game play engine from EA Games makes this one to watch. 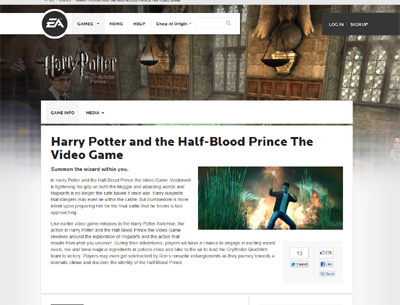 We have also compiled a Review System for this, of which Harry Potter Half Blood Prince is Rated as Five Stars, the highest possible score available from the Game Review Team.